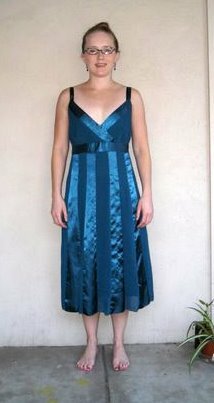 I wore this refashioned teal satin-and-chiffon cocktail dress to a wedding reception on Saturday night after wearing a more ladylike grey dress to the wedding. A Catholic wedding. Lots of stand up, sit down, stand up, kneel if you’re Catholic and if not sit down again,… The reception, in contrast, had a Patron tequila fountain with two flavors of slushie machines for make-your-own margaritas. Thanks to lack of coordination with the self-timer multi-shot function, I ended up with three angles of the dress. No, I’m not pregnant, just kinda fat in the lower stomach (“baby bump”) zone. To make the dress presentable, I shortened the straps, tightened the bodice, and lopped off a good bit of skirt. June 2, 2011. Tags: $1 Thursday, before & after, clothes, completed project, Goodwill, refashion, Target, What I Wore to Work Today. Links, Pictures, Projects, What I Wore to Work Today, Words.